Ok, I’ll admit it. I’ve been horrible about keeping everyone updated on the potatoes. But here’s the good, the bad and the ugly. First, I will say that we enjoyed wonderful organically grown Red Pontiac and Yukon Gold potatoes. BUT, not as many as we could have enjoyed if I had not made a couple of mistakes. Mistake #1: Grow only one kind of potato per bin. The varieties grew at different rates and when one would be 6″ above the leaves and therefore time to add more leaves or compost, the other was only 2-3 inches tall so I had to bury them too deep and think I killed a few of them. Also, in July, I had to relocate my potato bin because a local TV station wanted to come and shoot a piece on composting, and I had to move the bin to make room for the cameraman to get a good shot. And if you remember from the video, I used chicken wire instead of hardware cloth so the pile didn’t move very well. And the last issue wasn’t really a mistake: At some point, a volunteer Butternut Squash started growing and at first I didn’t know what it was and my curiousity dictated that I had to let it grow, and then when I realized what it was, I decided I wanted some BN squash as badly as I wanted potatoes, so I just stopped adding leaves about half way up the bin and let everything grow. After the vines bloomed and started turning yellow, I dug up the potaotes and we ate them with dinner that evening adn they were wonderful. Then I let the BN squash continue and we got 5-6 off of that vine (I had two more volunteer vines in the garden area, so it was a good year for BNS, especially since I did not plant any). But don’t let any of this discourage you from using this method to grow potatoes in your garden. I have seen this work with my very own eyes at Renfrow’s Hardware in Matthews. And David says to start bins at separate times so you have a succession of crops throughout the summer. He recommends (for our Zone 7B) March 15, April 15 and May 15. But, I don’t think I have the attention span to grow vegetables. Plants have to be able to take care of themselves in my garden because I’m too easily distracted by everything else that’s going on out there. 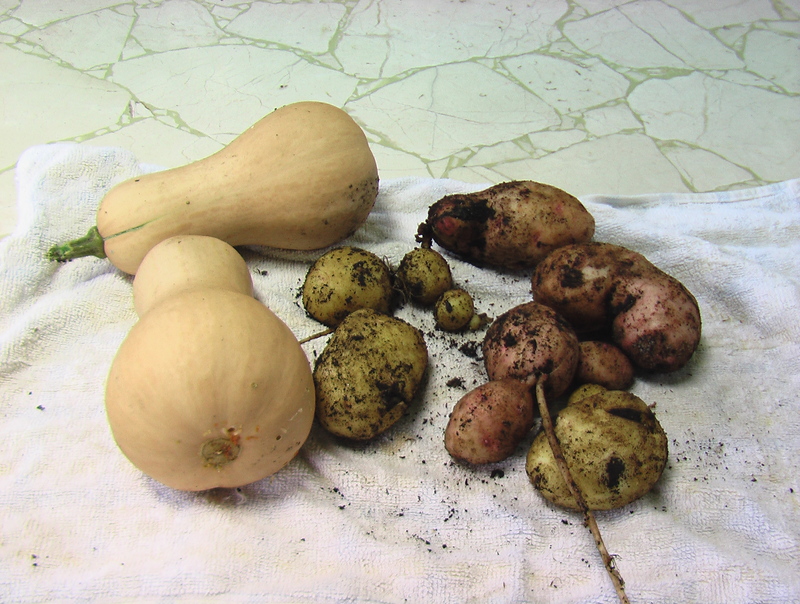 But, I wanted to grow something to eat and I did….just not as many potatoes as I thought…..but a banner crop of rogue Butternut Squashes! Its raining in the southeast and when it does, we gets lots of hits from people looking for information on how to buy rain barrels I decided to do a short post so that the information is easy to access. If you live in the Charlotte NC metro area, there are two easy ways to order rain barrels in April. 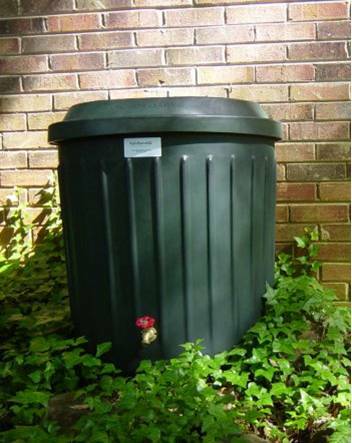 In Charlotte, order your rain barrels through Mecklenburg Soil and Water Conservation District but hurry, deadline to order is April 7. If you miss that deadline and live near Matthews, Habitat and Wildlife Keepers (HAWK) and the Town of Matthews have teamed up to sell the same rain barrels at the same price as the county. Send an email to HAWKncwf@gmail.com to order yours today, deadline April 15. And if you don’t live close enough to the Charlotte area to take advantage of these sales, contact your local county extension office and ask where you can get a rain barrel . Need another reason to save water? This video is not a “Smell Like Dirt” production, but its definitely worth watching. I expect the sales of rain barrels to spike! Here in the drought stricken Piedmont Area of North Carolina, its raining! And if you live in the Charlotte/Matthews, NC areas, you can order a rain barrel now for pickup at the Matthews Earth Day Festival on April 26 10a-2pm. 60 gallon rain barrels (like the one shown in the video) are $85 and the 80 gallons are $100. If you would like to order your rain barrel and start saving water, send an email to HAWKNCWF@gmail.com with your name, address, phone and indicating how many and what size rain barrels you want. And then I’ll look forward to meeting you at the Earth Day Festival on April 26th. The annual Mecklenburg County Tree Seedling and Rain Barrel Sale is just around the corner! If you haven’t already ordered your rain barrel, make sure you do it by Monday, January 14th. And when you are there picking up your Rain Barrel on the 26th, you can pick up a lot of great bushes and trees which are native to the Piedmont area of the Carolinas. This sale is an hugely popular event and even though the doors don’t open until 9am, lines start forming around 8am. There will be dogwoods, red maples, oaks, beauty berry, long leaf pine, button bushes and more on sale for $1-$5. For a complete list and more information, click here. Doors will remain open while supplies last, or noon, whichever comes first. If you miss out on the opportunity to get a rain barrel on the 26th, there will be other opportunities throughout 2008. For a list of the schedule, click here. Last October, we spent a week in North Florida kayaking the Ichetucknee River filming the amazing wildlife there (see video at right). And while we were there, we took a day and kayaked about 10 miles of the Santa Fe River. The Santa Fe is longer and wider than the Itch so you see some different wildlife, most notably, alligators! We only saw two on this trip. The Santa Fe has a unique characteristic in that it disappears at the O’Leno State Park and flows underground about three miles before it re-emerges. We launched downstream of the River Rise Park where it comes back above ground. Although O’leno is something you should visit at least once, we did not visit there this trip. The area where the river flows underground looks like a large pond and is filled with all the trash that ignorant litterbugs throw into the river, which is sad to see. There were about a dozen springs along the stretch that we kayaked. It started out as a cool fall day, but warmed up during the trip which took about 6 hours (lots of wildlife viewing slowed us down!). I hope you will enjoy this video of our adventures. Special thanks to Lauri Shubert, our best kayaking buddy, for the still photographs used in this vid. She does an amazing job of getting great stills of the flora and fauna on our trips. Over the last couple of days here in the drought ravaged Southeast, we have been experiencing a rare occurrence……RAIN! And fortunately, its the best kind of rain: a nice, gentle rain that is soaking into the ground versus a “gully washer” that runs off before the plants have a chance to take a drink. Its also a great reminder to install a rain barrel to keep some of the water for use later on when we are back in a dry spell. Mecklenburg County’s annual rain barrel sale will be January 26th, so I hope you will consider buying one for your garden. Deadline for ordering is January 14, 2008. And in case you haven’t seen our video and how to install a rain barrel, here it is again! Welcome to Smell Like Dirt! "In Spring, at the end of the day, you should smell like dirt." --Margaret Atwood. I believe we are losing our relationship with nature and with it, the understanding that how we live impacts the world around us. This blog will explore ways to reconnect to nature: Gardening with native plants, creating a haven for wildlife in your backyard, tips on living green and fun ways to experience our abundant natural resources. Its time to get outside! I smell like dirt, do you? China's top steelmaking city of Tangshan in Hebei province issued a second-level pollution alert on Friday in response to a wave of smog expected to blanket the region, the local government said in a statement via its social media account. Climate activists blocked hundreds of employees from entering the headquarters of French bank Societe Generale, state-run utility EDF and oil giant Total on Friday, environmental group Greenpeace said. Teenage protesters staged an emotional protest at political inaction on climate change near London's Heathrow Airport on Friday, a further day of actions that have caused transport snarl-ups in the British capital. A second wave of tornadoes and thunderstorms to hit the U.S. South and Midwest this week turned deadly on Thursday with three people reported killed, as the storms pushed eastward on Friday, officials and media accounts said. China on Friday said it would promote using energy generated by the wind to help power heating systems during the bitterly cold winters seen in many parts of the country. South Korea plans to boost the share of its energy output generated from renewable sources to as much as 35 percent by 2040, a draft revision to government policy showed on Friday, over four times the current amount. Tokyo Electric Power plans to allow overseas workers coming to Japan under a new visa program to work on the cleanup of its wrecked Fukushima nuclear power station north of Tokyo, a spokeswoman said on Friday. Brazil's president Jair Bolsonaro said on Thursday that he wanted the country's vast Amazon rainforest to be exploited "in a reasonable way" and criticized the creation of new indigenous reserves by previous governments. The Extinction Rebellion group of climate change campaigners said it planned to hold a protest at London's Heathrow Airport on Friday, opening a new front in its demonstrations that have caused transport snarl-ups in the British capital. A SMELL LIKE DIRT STORE!